At LINE-X, we know your truck is much more than a vehicle to you. It can be your workhorse or your plaything. 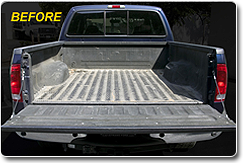 Either way, it takes a serious beating, with your spray-on bedliner taking the brunt of it all. Which is why we’ve created LINE-X ReNew. 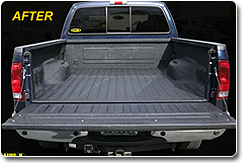 LINE-X ReNew is the only bedliner enhancement system available that repairs and enhances your current spray-on bedliner. It is so revolutionary that Frost & Sullivan awarded LINE-X Renew its coveted Product of the Year Award in 2008.
man-made material that is five times stronger than steel, making your truck bed stronger than just about anything you can put in it.